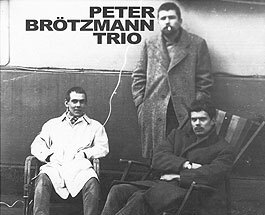 Peter Brötzmann, tenor saxophone; Peter Kowald, bass; Sven-Åke Johansson, drums. Recorded in August 1967 in Kungsträdgården, Stockholm. This is a single sided 10" LP released in a limited edition of 500 copies for the first time in January 2003. Photograph (front cover reproduced above) by Krista Brötzmann.